Freaky 23 : Underground Parties in Berlin with SP23 and special guests! 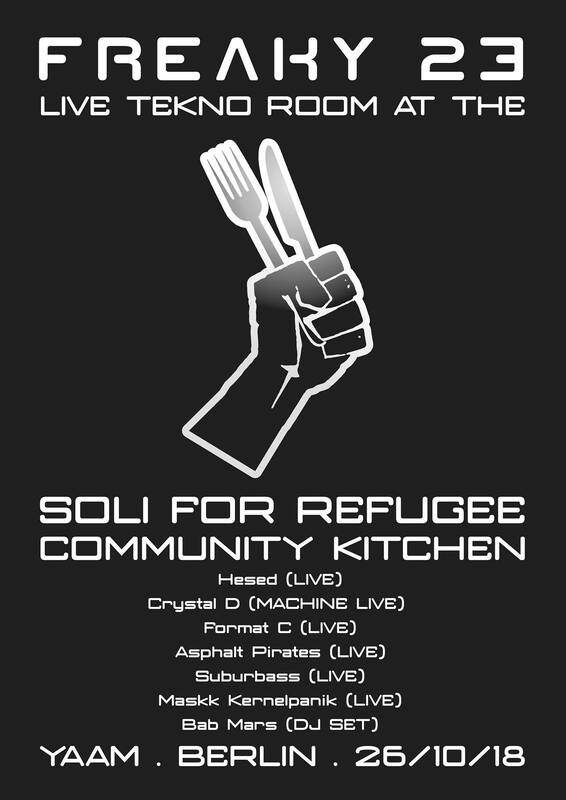 Freaky 23 Present the Tekno floor at the Artists in Action soli concert and party for Refugee Community Kitchen on 26/10/18 ! Freaky 23 is an underground community of music lovers based in Berlin. We regularly feature artists from Spiral Tribe, SP23 and work with international artists and DJs. Over the last year we have held some of the biggest and musically diverse underground parties in the city. Join us to get your invitations to our dance parties, free downloads and other Freaky stuff. Sign Up for info as it becomes available. Keep it underground, keep it Freaky! IMPORTANT: Check your spam and junk mail folders, because we use an automated mailing platform (mail chimp) occasionally our emails get put in the trash !